CrunchBang - Weblog van Jacqueline P.
I have been using Linux forever. In 2003, I registered at Linux Counter. I have been using tons of Linux distro’s. I’ve started with Caldera, went on to RedHat and used Slackware for a while. After then I sorta stuck to Debian and Ubuntu. And recently I’ve found CrunchBang. I think it’s quite good. Why CrunchBang is cool #! Here’s a review. I did some minimal tweaks, let’s describe them below. To use Conky to display keyboard shortcuts is brilliant for those with memory leaks. I’ve added some exta shortcuts for VIM, NERDTree and Terminator. Here is a link to my conkyrc. 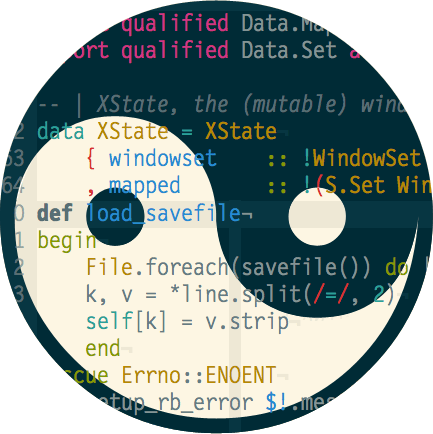 I decided to change the colorscheme to Solarized from Ethan Schoonover. Here is the github repo with the config file for Terminator.